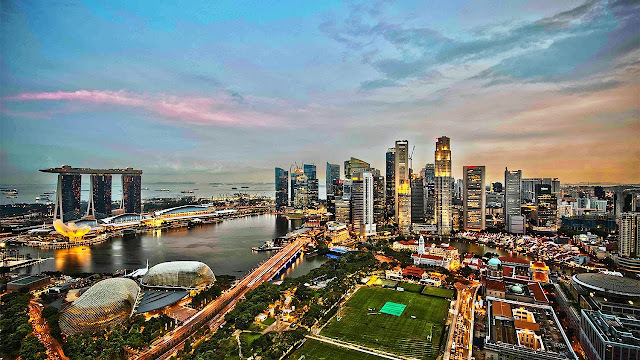 Singapore officially the Republic of Singapore, and often referred to as the Lion City, the Garden City, and the Red Dot, is a global city and sovereign state in Southeast Asia and the world's only island city-state. It lies one degree (137 km) north of the equator, at the southernmost tip of continental Asia and peninsular Malaysia, with Indonesia's Riau Islands to the south. Singapore's territory consists of a diamond-shaped main island along with 62 other islets. Since independence, extensive land reclamation has increased its total size by 23% (130 km2), and its greening policy has covered the densely populated island with tropical flora, parks and gardens. Singapore is a global commerce, finance and transport hub. Its standings include: "easiest place to do business" (World Bank) for ten consecutive years, most "technology-ready" nation (WEF), top International-meetings city (UIA), city with "best investment potential" (BERI), 2nd-most competitive country (WEF), 3rd-largest foreign exchange centre, 3rd-largest financial centre, 3rd-largest oil refining and trading centre and one of the top two busiest container ports since the 1990s. Singapore's best known global brands include Singapore Airlines and Changi Airport, both amongst the most-awarded in their industry; SIA is also rated by Fortune surveys as Asia's "most admired company". For the past decade, it has been the only Asian country with the top AAA sovereign rating from all major credit rating agencies, including S&P, Moody's and Fitch.